In just a few weeks we went from 80° to frosty morning grass and snow on the mountains. Flannel sheets on the bed make it almost impossible to wake up in the morning, and we are greeted by our frozen breath as we step outside and head for school. There is woodsmoke in the air, and soup on the stove. I am so excited that soup season is finally here! I love the smell of warm soup floating through the house on a chilly afternoon. One of my favorite things about soup is how versatile each recipe is. You can look at a recipe and follow the basics, but add a little here or there depending on what you have in your fridge. I had one last summer squash from the garden I threw into this soup, as well as a handful of fresh herbs. Come winter I might add butternut squash. No sausage? No problem--make it meatless. 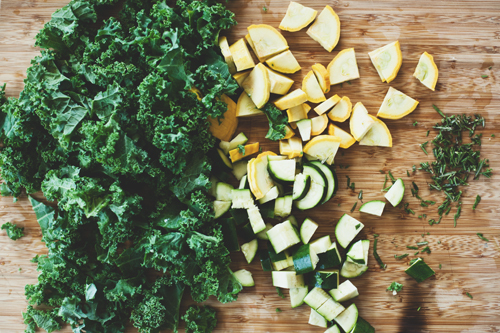 Swap out the kale for chard. I wanted to share another recipe from the cookbook I photographed. 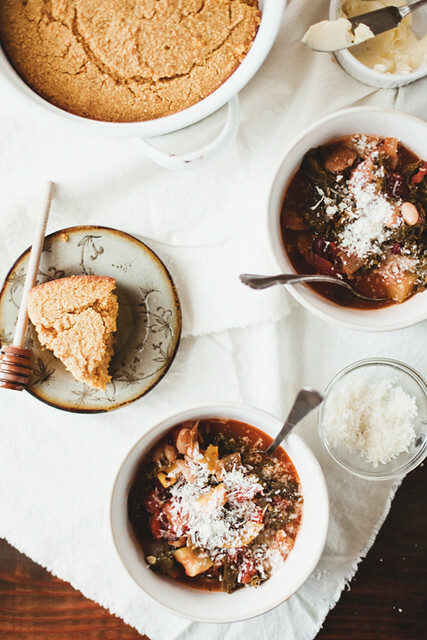 Along with all kinds of meaty entrees, vegetarian dishes, sides, pastas, and the best desserts ever, there are eight different soup recipes for you to fall in love with. Classics like chicken noodle and beef stew, and new recipes for you to try like Corn Chowder with Bacon and Chives, and Red Curry Carrot Soup. The Creamy Chicken and Rice Soup has been a huge hit on #thefamilyflavor hashtag on Instagram. This soup has three things going for it. Sausage, slow cooker and loads of healthful veggies and beans. Everyone loves a good slow cooker recipe, something to throw together in the morning and let simmer throughout the day. This recipe involves a bit more than just throw-in-the-pot-and-stir. But to avoid the inevitable evening dinner time chaos, take a few moments in the morning to chop up the zucchini and kale and also cook up those Italian sausages so they will be ready to stir in before serving time. And on your way home, drop by your local bakery and pick up a loaf of good, crusty bread. In the slow cooker pot, add diced tomatoes, tomato sauce, both beans, chicken stock, onion, garlic, salt, basil, oregano, rosemary, thyme, fennel and red pepper flakes. Stir well to combine and set slow cooker to low. Cook for 6 hours. In a large skillet over medium heat, cook sausage links for 15 minutes, flipping once, until sausage is cooked through and set aside. Once cool enough to handle, slice sausage into ½-inch thick slices. Add sausage, zucchini and kale to the slow cooker and stir well to combine. Cook on high for 30 minutes. Serve soup with Parmesan cheese on top. And soup would not be soup without some kind of warm bread on the side. 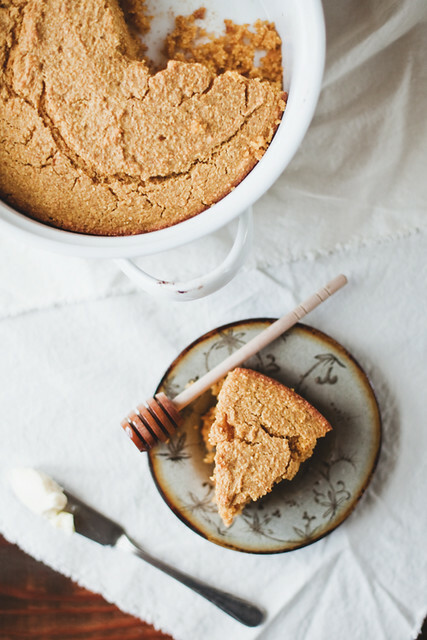 Our cold windy Sunday called for cornbread out of the oven and honey. I made up this recipe a few years back and it is one of our fall favorites. Mix wet ingredients in another. Slowly combine and stir until just mixed. Pour into well buttered pan and bake at 425° for 13-15 minutes, or until toothpick inserted in center comes out clean. top with butter and honey and enjoy! 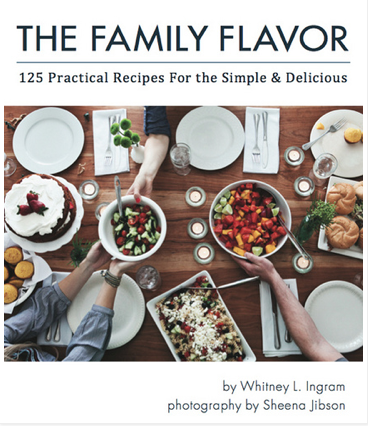 Have you got your copy of The Family Flavor yet? The internet drives me crazy 9 days out of 10. One day is it praising the health benefits of "_____", the next day it's telling you how that very same "_____" will make you die a slow and painful death. And then we panic because "_____" was our new favorite health food. You want to know what I think? I think people worry too much. We have so much information and knowledge at our fingertips, but somethings I think it's tooooo much. You can find something bad about everything you eat these days. So what do WE do about it, here in our house? Let me tell you our secret.....we just eat food. A little of this, a little of that. All of it in moderation--well balanced. I don't buy processed meals and snacks, we don't eat fast food. We are lucky enough to get our beef and milk from right down the road. We love fruits and vegetables in all shapes and forms. I have been teaching my kids about nutrition labels and ingredient lists. Our rule? If you can't pronounce one of the ingredients, we don't buy it. We don't follow special diets, or programs, or plans......we just eat food. I could write pages and pages on this. But what it comes down to for me, is eat what YOU want, and then ignore everyone else. Because we are exposed to so many (too many) dietary options on the internet, we start to feel guilty that WE don't eat the way THEY eat. He's Paleo every day except on the weekends. She only eats raw foods every day except Monday. She juices 27x a day. No one ever eats a cookie. It leaves my head spinning......so I just eat. Moderate means "balance", so for ME, that means a little of everything. Maybe for YOU it means something different. It is also important to me that my kids grow up having a good relationship with food. They know that sugar isn't good for our bodies--but they know it's ok to have from time to time. It's ok to ENJOY food. They know that even though a big salad full of every kind of organic homegrown vegetable is GOOD for our bodies--it still wouldn't be good to eat that same salad every day. We need variety in life. I asked on Instagram what moderation means to YOU, and loved the answers I got. So many of you said that you find it important to "listen to your body". YES! Your body knows what it wants and needs. It also knows when it has had too much of something it doesn't need. When I am running lots of miles, I crave protein--usually fish and beef, and complex carbs. I actually crave less sugar when I am running more. I make sure to always listen, and fuel my body with what it wants, instead of eating what the internet wants me to eat. Let's talk a little more about sugar. Sugar isn't good for you, for me, for anyone. We all know that. But guess what? 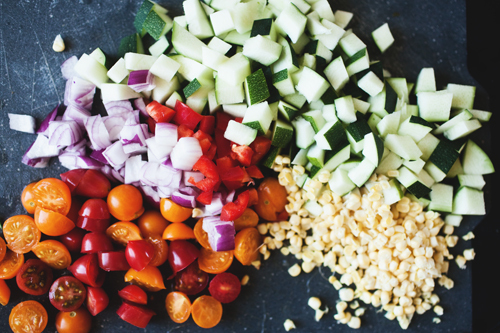 I could spend all day every day eating a perfectly clean diet--it would be hard, but I could do it. But when I'm on my deathbed at 114 (I think I could live that long on a perfectly clean diet) I guarantee I would wish I'd enjoyed my food a little more. Ate a piece of cake with friends. Had cookies waiting when my kids came home from school. Dunked a piece of crusty sourdough into my soup. For me, so much about eating is about the EXPERIENCE of food. I love to bake--and I love to share those baked goods with people around me. A few weeks ago we went out to dinner with our good friends. We passed our plates around the table to share, and the conversation lasted for hours. We took the kids to ice cream last weekend--there's just something wonderful about eating an icecream cone with your favorite little people. I love the experience of food. So could I eat a little better? Yes. But.....I am fully enjoying my life by trying to keep a balance, and trying to keep my nose out of everyone else's business. We eat well, we are blessed and happy. 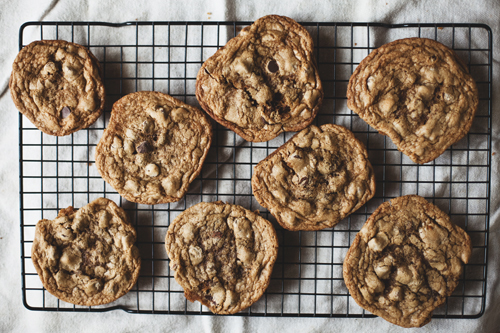 So because I believe in moderation, I believe in cookies in the fall, and here is my favorite cookie recipe for you to eat and share with friends. Cream the butter, sugars, and molasses until light. Scrape down the side of the bowl. Continue mixing while adding the eggs one at time. 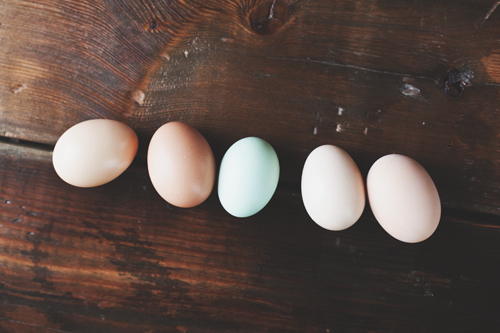 Make sure each egg is incorporated before adding the next. Beat for a few minutes. Add the vanilla and mix well. Scrape down the bowl with a spatula. Combine the flour, soda, cinnamon and salt in another bowl. With a whisk, stir to combine. With the machine on low, slowly add the flour mixture and chocolate chips. Mix until just combined, taking care not to over mix. Drop by spoonful onto parchment lined cookie sheet. Give a little sprinkle of sea salt before you pop them in the oven if you like. Bake at 350° for 11-13 minutes. They should be lightly golden on the outside but still soft in the middle. and don't eat all of them......since we just talked about moderation. or do ....and don't tell anyone. What does moderation mean to you? Yesterday was a very good day. Up until yesterday we'd only been getting two a day. So FIVE eggs was ridiculously exciting.....and the fact that we got our first little GREEN egg.....aaaaahhhhh!!!!! Really. I screamed. Eggs are that exciting around here. All that hard work (ok. chickens aren't really that much work....but they were in my house for 6 weeks....) has finally paid off. So yes, we eat a lot of eggs these days. -crack eggs and cover with a lid. 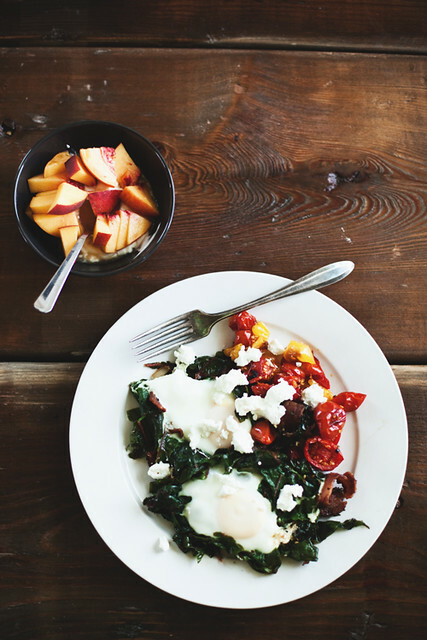 -cook the eggs for a few minutes--the steam from the chard cooks them pretty quickly. Add a giant scoop of your roasted tomatoes and top with goat cheese. and it's still peach season so we had peaches and yogurt for dessert. I finished a marathon. Don't I look different? I still remember running the mile in highschool PE. I HATED it. I remember telling myself with each painful lap that as soon as my school PE classes were over with, I would never ever ever run again. And then I gained 12 pounds my freshman year of college. So when I was planning a wedding at 19 (also true. this post is full of surprises! ), I needed to get myself back into shape. Or at least, some kind of shape. I started running. Here, and there. A mile or two. We were newlyweds with terrible diets and little time, so I tried to keep up my low mileage runs, and continued to hate almost every step. Three years later a baby was born. I would log slow and painful miles when daddy was home with baby boy, not so much loving the running part, but loving how quickly my body was bouncing back because of the running. We moved from California to Utah and I signed up for a 10 mile race with a friend. I had no idea what I was doing, what to wear, or how on in the world I was going to run 10 miles. So for me, I've been a "runner" for 7 years. I ran a few road half marathons, 6 Ragnar relays, gave up the road for good and ran a few trail races, 100s of miles on the trail just for fun, and three weeks ago I ran my first ever [trail] marathon. "you've been running for 7 years and you just ran your FIRST marathon? Then you haven't been a real runner!" "What marathons have you run???" and then the conversation usually ends. "well I've never ran a marathon, so I guess I'm not a real runner." I've also known too many new runners who skip the 5k, skip the 10k, skip the 1/2 marathon, completely beat up their feet, trash their knees, and beat their body so they can hate every single step of 26.2 miles.....JUST so they can say they've ran a marathon, and therefore be accepted as a Real, Official, Runner. If you run--any distance--and you semi enjoy it, most of the time, then YOU my friend, are a real runner. Are you fast? Are you slow? Are you running? Then you are a runner. Don't let a stupid number determine what you are. In June I ran my furthest distance yet--20 miles (read about it here). It was a tough trail, with 4500ft to climb, but I finished feeling strong and knowing I wanted to do more. 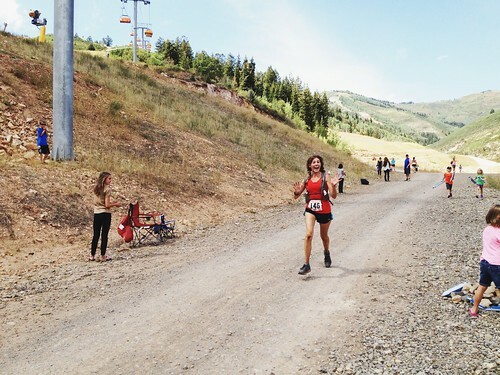 In August I signed up for a trail marathon in Park City. I had four weeks to train. I wasn't starting from scratch--I'd been running short distances, hiking, and climbing mountains all summer, but I was a bit nervous because I hadn't really got any decent long runs in. I threw in a handful of short runs and got excited....I was going to run a great race. It was a beautiful morning. A little warm, but I knew I'd be in the pines and aspens most of the way. My pack was loaded with lots of water, EFS, and S-Caps, and we were off. Right away I got into a good group of runners. A good push--not too fast, comfortable, and small conversations here and there as we ticked away the miles. But here's the thing......it kind of allllll blended together this time. Smooth, perfect singletrack through giant pines and aspen groves (really--this trail was perfect). Roller coaster ups and downs--a very runnable course. Lots of aide stations, lots of friendly people to chat with in passing, and surprisingly no dark moments. No "hitting the wall"--just hitting the ground once....HARD. I don't think I have ever crashed so badly--or laughed so hard at myself (by myself). While I felt mostly good mentally the whole way--my body was definitely tired, legs heavy, feet slow (oh you know, probably because I was a lousy trainer). Somewhere in the late teens of mileage my feet were heavy and too lazy to get up and over a big root and I flew--arms out, legs in the air, (all in slow motion, mind you) and sailed through the air, coming down sprawled out in the dust. It tweaked my knee, and I had to run through that for a few miles, but other than that and a few really awesome blisters, the miles continued to fly by--I couldn't believe it when there were only a few miles left to go. Before I knew it I was heading down a stretch of dirt road that led to the finish. look at my tiny two back behind me!! I finished happy--I think I could have probably pushed a little harder, I definitely could have trained better, but overall it was a good race. has my life changed since I finished a marathon? Do I feel different now that I am a REAL runner? Was it the absolute best thing I've ever done? You guys, I'm here to tell you.....it was just another race. Just another run. 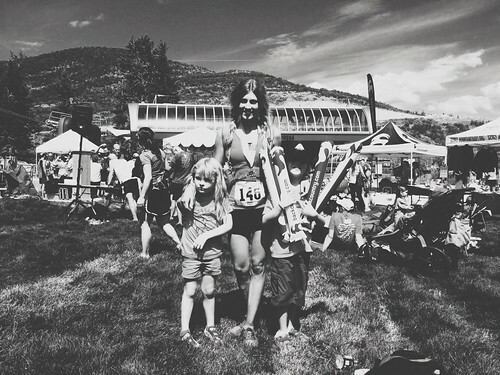 I was EXTREMELY happy to finish--don't get me wrong, but I feel the same happiness at the end of any race. Any goal accomplished feels good. There were great parts and hard parts and funny parts. I got dirty (I finished with a dirt-stache), I ended with a smile on my face....and that's why I liked it. And THAT'S what makes me a runner--not a number, not a time, just the feeling I get when I'm running (and sometimes falling). So I'm a big time marathoner now. What's next now that I'm legit? I'm thinking a 50k might be fun(?) within the next year.....what does that make me? all my gear was exactly the same as it was in THIS post--check it out I have every single detail for you + fav products. food was all the same too except I had chicken and veggie stir fry for dinner the night before. 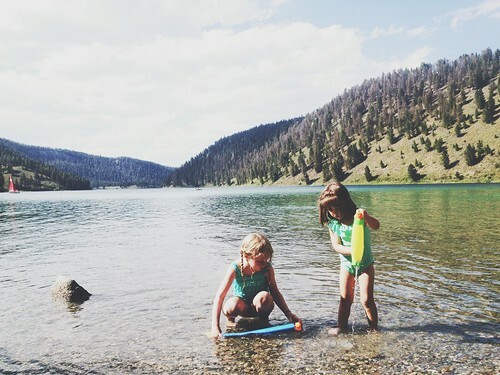 ....just a few phone snaps from a little Montana lake this august. 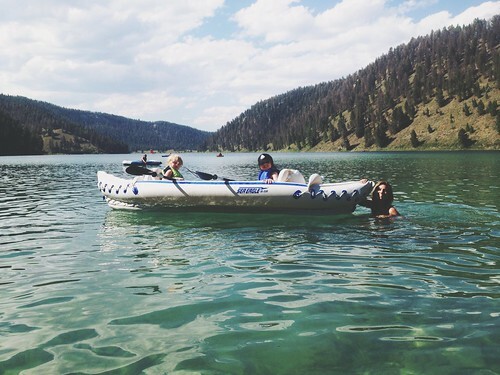 YOUR How-We-Weekend photos from the summer are amazing--what a summer you all had! This has been my favorite weekend post to put together so far--thank you all for your contributions over these past few months--keep them coming! I have so much fun looking at how you spend your weekends. 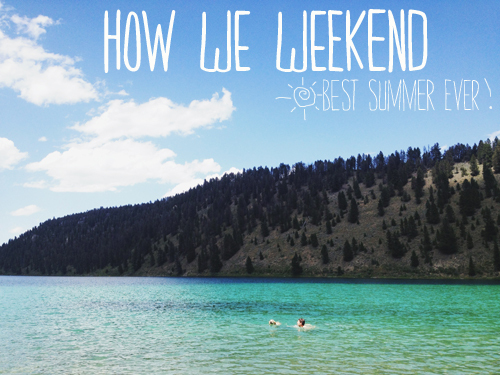 #howweweekend for a chance to be featured next month. All day yesterday I thought about Kassidi. I was sitting at my table eating breakfast--my house was quiet, chilled but sunny. I thought about her as I ran through the leaves that are slowly transitioning to red and gold. I had to write these thoughts down. Kassidi and I went to rival highshools--we played against each other in basketball and spent long summer days together at girls camp. I know her husband Brandon from school as well, and let me tell you, they are fantastic people. I haven't seen Kassidi since we were teens--but thanks so the miracle that is the internet, we have been able to keep in touch. Yesterday Kassidi did her LAST of sixteen chemo treatments for breast cancer. She has two young children at home. She is fighting (and winning!) cancer. Yesterday she celebrated her last chemo. Her battle isn't over yet--she still has radiation and surgery, but for right now, she celebrates a HUGE victory. I think of all the dumb things we worry about day to day. Silly little things that weigh on our mind and get us down. How easy it is to forget ALL of the tiny miracles that take place each day, and each are a reason to celebrate. Kassidi is celebrating the end of chemotherapy--I'm sure you can find something to be grateful for as well. 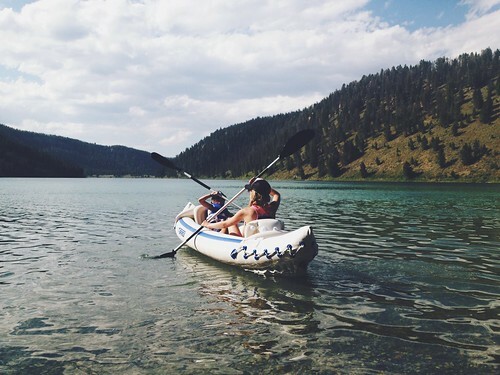 "I remember feeling that nothing else mattered in that moment. The chairs I had been looking at on craigslist the day before. Worrying about our van, and our financial situation. Where we're going to end up after college. The kids' messy rooms. The colors and patterns of things on pinterest I was loving. EVERYTHING. You name it, it didn't seem to matter anymore. What mattered now was what I was going to do with my time. How was I working on, and cultivating, the relationships I already had?? How was I connecting with these people? How was I sincerely showing these people that I loved them, and secondly how often was I allowing God to help me. How was I going to show Him my appreciation, and how was I going to serve Him?" I have a gratitude journal that I got 2 years ago. Guess how many pages are filled out? ONE. This will change--today--I have so much to be thankful for and celebrate. A few big things. A million little. Things that matter. People that matter. My body is healthy and strong. A few years back it wasn't. I have been symptom free of my Lyme for 1 1/2 years now--and I am thankful for that every time I run through the mud or climb a mountain with my kids. My kids and husband are happy and healthy and wonderful and smart and funny. We live in a beautiful place with the most amazing people near. Sure our house is old and quirky and we lose a few shingles every time the wind blows......but does that matter? fridays. and saturdays. and sundays. it's pumpkin and squash season! Find things in your life to be thankful for. Kassidi has inspired me in many ways lately--and I'm hoping to start something here that can [hopefully] continue to inspire others. I want to know their story--I want to share it here. I don't want to feature someone because they have a "dream house" or fantastic "style". I want to meet people through this world wide web who are living a life with purpose and intention. I want to know them. Share them with me! I'm going to check back in with Kassidi in a few months and talk with her and share with YOU all her gems of knowledge. send me to their site. Maybe they aren't online--send me an email: sheenajibson at gmail. Elise Dear--you won a signed copy of our book! Thank you guys and gals again for all your kind emails and comments, your excitement, and THANK YOU for buying our book! If you haven't got your copy yet get it HERE. 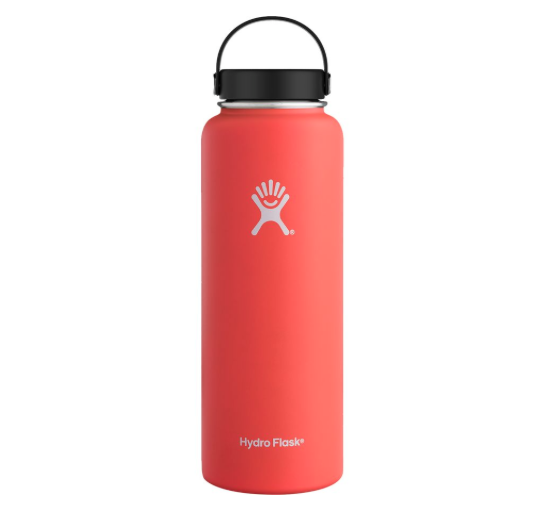 It's on sale for $14.25! "This book is perfect, let me tell you why....I love cookbooks, I own so many of them. I feel like sometimes I see the same recipes over and over with just little tweaks here and there. This book I felt like there were quite a few recipes that I had never seen. The recipes are new and fresh, which was a relief to see. But at the same time every recipe I knew wasn't too complex and I could pull it off. And that also I wouldn't have to spend hours on the meal or have all my pans dirty from making the dish. The photography is homey, beautiful, real....visually a great cookbook. The author's commentary before each recipe had me smiling a lot too, very clever. My in laws just came to visit and I made some meals from the book. Quite a few of them my MOTHER IN LAW said were the best food I have ever made. I loved my copy so much I bought 10 more and am giving them to all my (and my husband's siblings) for Christmas. GET THIS COOKBOOK!!!" "Just made my first recipe from TFF and it was huge, huge hit for the whole family. I spent all weekend salivating while enjoying the recipes and photography of this beautiful cookbook. 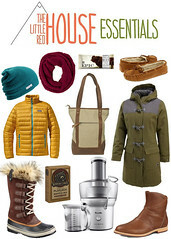 Here's what I love best: it strikes a great balance between being practical, but also creative and unique too. Some cookbooks are too practical (read: boring) or too creative (read: 5 trips to different grocery stores to gather all the ingredients). TFF is a great balance of the two. This would be a great gift for anyone from a rookie cook to an advanced home chef, for a recent college grad to a favorite grandma. It has something for everyone!" "These recipes are delicious, easy to follow and the pictures are stunning. The intros to the recipes make you feel like you know the author and are sitting around the dinner table with her. I oftentimes have buyers remorse with cookbooks, finding I don't like about half of the recipes, but I certainly don't feel that way about this one! You will not regret this purchase!" "I love this cookbook! I bought two more today as gifts. I was a little worried it was going to be too fancy for my family (my family is a little picky) but every recipes looks like something they will LOVE. It is an amazing cookbook. Thanks for inspiration Whitney and Sheena." And soooooooo many comments about The Brownies. You guys! I told you they were the best--I would never lie to you when it comes to dessert. "So I just made the brownies and holy crap!!! I die." Check out #thefamilyflavor hashtag on Instagram to see what people are making! It's not that I don't like pie--I'd just rather have a warm cookie or a giant piece of chocolate cake or Whitney's brownies. But the man I love is a pie guy, and I had a billion pounds of berries that I got at the farmers market....so into a pie they went. What I realized is that pies are really pretty easy.....at least the filling part of pies. The crust is annoying and frustrating and terribly fragile and did I mention frustrating if you are not a pie maker (ahem)..... but once that part is over it's just berries and sugar and you have yourself a pie. this recipe is tender and flaky AND makes 3 crusts--extras to stick in your freezer and pull out for a quick and easy pie. When you are ready to use the dough to make a crust, remove from the freezer and allow to thaw for 15 minutes. On a floured surface roll the dough, starting at the center and working your way out. (Sprinkle some flour over top of the dough if it’s a bit too moist.) 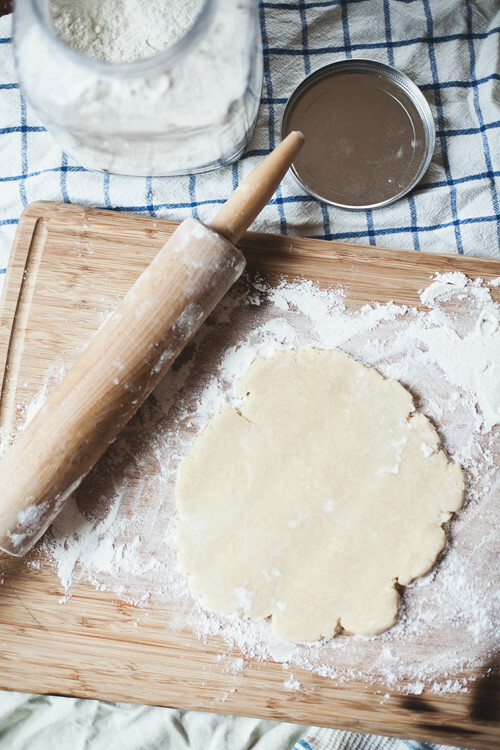 If the dough is sticking to the countertop use a metal spatula and carefully scrape it up and flip it over and continue rolling until it’s about ½ inch larger in diameter than your pie pan. 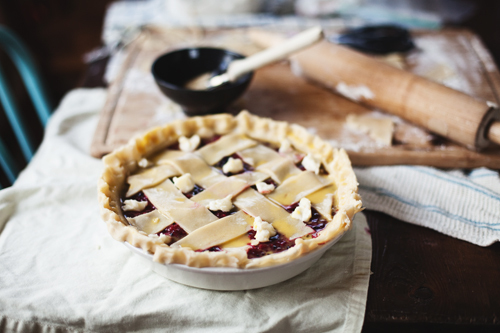 With a spatula, lift the dough carefully from the surface of the counter into the pie pan. Gently press the dough against the corner of the pan. Go around the pie pan pinching and tucking the dough to make a clean edge. My blackberries were on the tart side, so I wanted to balance them out with the sweetness of raspberries. Preheat the oven to 400 degrees F with a baking sheet on the middle rack. 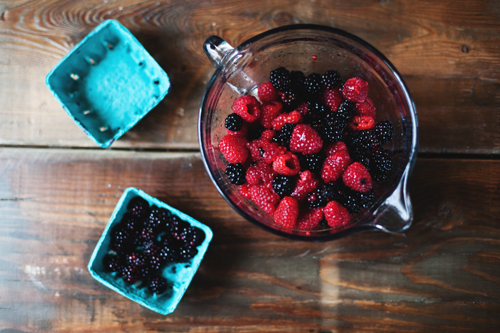 In a large bowl, toss the blackberries, raspberries, sugar, cornstarch, cinnamon. Let stand, mixing and coarsely mashing occasionally, 20 minutes. Fit one round of dough into a 9-inch pie plate. Trim the edges, leaving a 1/2-inch overhang. Refrigerate while you continue. Cut the remaining piece of dough into approximately eleven 11/4-inch-wide strips. Spoon the berry mixture into the pie shell. Dot the top with the butter. Arrange the dough strips in a lattice pattern on top of the filling and trim the strips close to the edge of the pan; roll up and crimp the edge. Lightly beat the egg with 1 tablespoon water and brush on the top and edge of the pie. Place the pie on the hot baking sheet in the oven and bake until the filling is bubbling, 45 minutes to 1 hour. If the crust browns too quickly, cover it with foil and continue baking. Let the pie cool before serving. Top with vanilla bean ice cream and enjoy with friends. forEVER now I've been wanting to add a little here and there to the blog....but I'll need YOUR help. Have juicy information related to a post? Leave it in the comments! Link me to it. Come follow in instagram (@_sheenarae) and facebook (HERE) so we can become a community and good friends and all that fun stuff. I want to get to know more about YOU and what you like. and I may be looking for help with posts in the future.....so let's become acquainted. Let's all learn from each other. 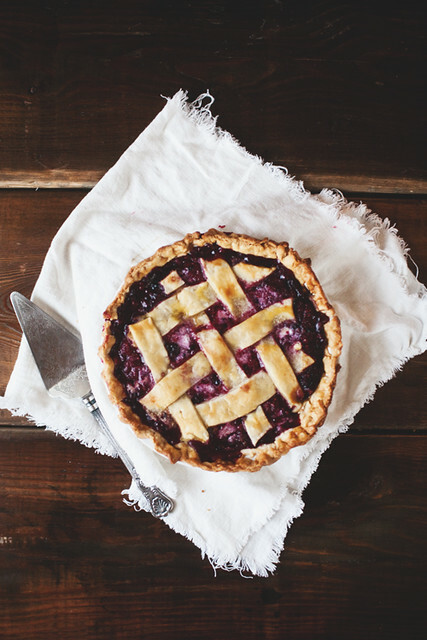 What are your favorite pie recipes? 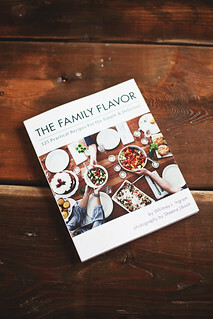 *the giveaway for a signed copy of The Family Flavor ends tonight! We may be moving into fall, but all the best summer foods are still easy to find.....I LOVE this time of year for food. And the next month only gets better as we start to add the fall and winter squashes to summer staples. Here are a few favorites right now. 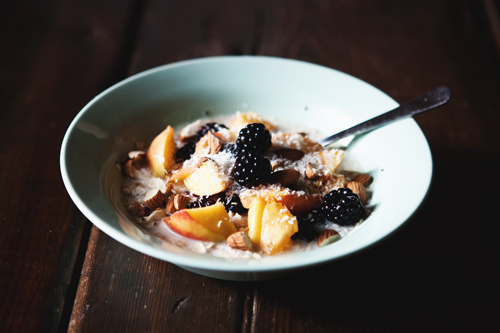 raw oats is one of my favorite breakfasts....it's so easy and filling. 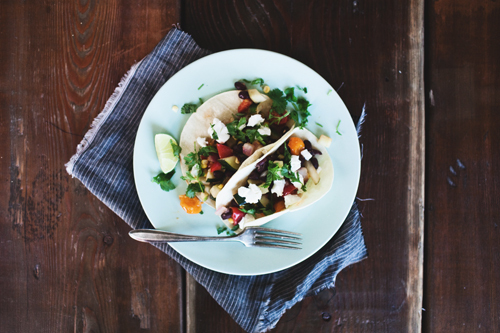 and here is one of THE easiest dinners you can throw together on a late summer evening. looking for more late summer favorites? 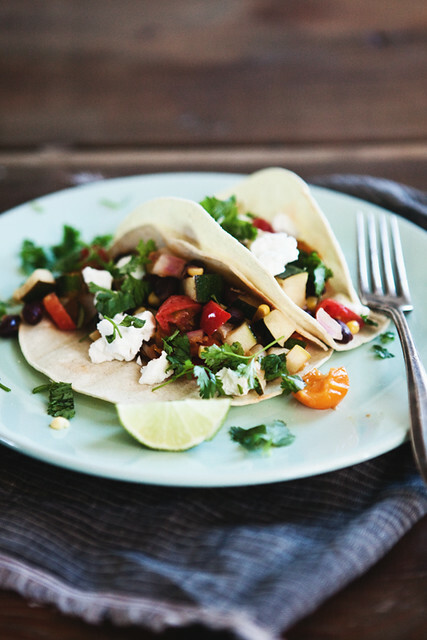 What are your favorite end-of-summer eats right now? photographing a cookbook + The Family Flavor giveaway! me. last winter. on whitney's head. photographing. pie. What is it about food that you like photographing? I get to eat it! I seriously loved showing up to a shoot at Whitney's and have 3...4...sometimes 5 dishes to try. I love that I can play around with each dish and style it a bit, and it won't run away from me like a 3 year old would. Food is beautiful. The whole process of taking a bit of this, and a pinch of that and bringing them together into a dinner, or a cake.....I just love that process. I love being able to capture it. 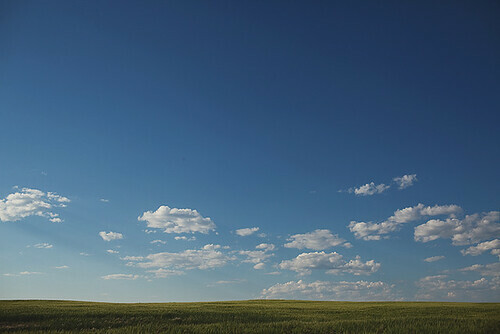 Canon 5D Mark II, and most of these photos were shot with a 24-70mm f /2.8 lens. Where do you get all your props? Everywhere. I pulled stuff from my own cupboards, from Whitney's cupboards. Clearance aisles at target. Garage sales and thrift stores for dishes and silverware. We wanted every recipe to look like an actual family meal--nothing too fancy or matchy or perfect. Real. I shopped Home Depot for boards and tiles for backgrounds. What kind of food is your favorite to photograph? Dessert! It's just so pretty. You really don't have to "style" desserts at all--just shoot (and eat) and they look great. How did a typical shoot go? This changed so much from when we started, to two years later when we wrapped things up. When we first started, I would load every single dish/spoon/board/material/EVERYTHING I had into my car and head to Whitney's. She would cook a dish and I would decide how I was going to shoot it. I had no plan. As we went on, and worked together more, we had a system down. 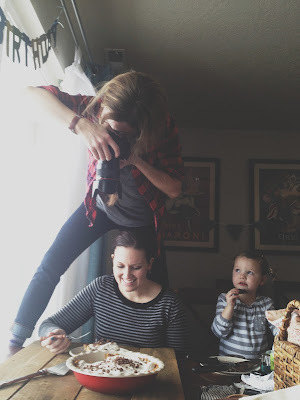 We would figure out our menu for the next shoot and I would visualize how I was going to photograph it, and only bring what I needed for that shoot. Our first few shoots took 4-5 hours, we whittled it down to 1-2 hours. What kind of food is hard for you to photograph? Whitney answered this for me and said "MMMMMEEEEEAAAATTTTT!" I'm not a huge meat eater, and when we started this whole thing I wasn't sure how I was going to photograph some of the meaty dishes....I just didn't have the vision. Like meatloaf! It's a loaf. Of meat. How can you photograph that? But with each meat dish I learned more and more what I liked to do (add color! ), and what I didn't like, and soon got my meat-ography down. One of my favorite pictures is the Grilled Ribeye Steak with Rosemary Gorgonzola Butter. Were there any mishaps in the food photographs that we wouldn't be able to notice? We said right from the beginning that we would never "fake it" when we came to our photos. No tricks of the trade (like glue instead of milk in the cereal bowl). We would only photograph REAL food so the results look the same when YOU make it at home. With the Spiced Pear Cheesecake, we didn't have an extra pear for the garnish, so she sauteed some apples and we pretended they were pears. (page 229). And with that, the time has come to wrap up Cookbook Week. Thank you all again for your support this past week as we have celebrated the release of our book! I'll return back to regular blogging next week, but I'll be sure to let you know when we have exciting updates and deals you will want to check out. Comments will close on Wednesday, September 18 at 8:00pm MST.